More than half of the over 14,000 people killed since the Syrian began 16 months ago were slaughtered in the past four months, according to tallies from opposition activists. June was a particularly gruesome month, with 2,386 people killed compared to 1,196 in May, the Local Coordination Committees of Syria said. The bloodshed continued Sunday, when five people were killed in Hama province “in another massacre committed by regime forces,” the LCC said. In addition, three bodies were found in Idlib province, the group said. A day after world diplomats agreed on a new plan to help end the violence, the LCC slammed the efforts and dismissed them as superficial. U.N.-Arab League special envoy Kofi Annan invited diplomats from the U.N. Security Council and envoys from Turkey, the United Nations, the European Union and the Arab League to the global meeting in Geneva on Saturday. Those at the meeting agreed that the first step should be a renewed commitment to a cease-fire by both the regime and opposition fighters, as well as the implementation of Annan’s six-point peace plan without waiting for the actions of others, Annan said. But a key to the process will be a transitional government, which Annan said could include members of the current Syrian regime. That makes it possible for President Bashar al-Assad to be a part of the transition, but Annan pointed out it is the Syrians who will decide the make-up. But the LCC said it was “gravely concerned” by what could happen in a transitional period with President Bashar al-Assad’s military and security forces. U.S. Secretary of State Hillary Clinton said the plan makes clear the Syrian president cannot stay in power. “Assad will still have to go. He will never pass the mutual consent test, given the blood on his hands,” she said. The agreement in Geneva also calls on the Syrian government to release detainees and allow journalists access to the country. The right to peaceful demonstrations must be respected, Annan said. Clinton said the U.N. Security Council should endorse the plan, thus allowing the possibility of sanctions against Syria if the requirements aren’t met. Russia, widely viewed as a key ally to the Syrian regime, said the agreement should not be interpreted as outside powers imposing a transitional government on the Syrians. That process must come from inside Syria, Russian Foreign Minister Sergey Lavrov. As diplomats plotted their next strategy Saturday, a large funeral procession made its way through a Damascus suburb, clapping and chanting loud slogans against the government. The man they were burying was wrapped in a Syrian revolutionary flag and had allegedly been killed by government forces. The crowd waved additional flags and shouted for freedom. Then there was a deafening explosion. In what opposition activists say was a government-organized car bombing, 85 people were killed and more than 300 people were wounded, most of them in critical condition. Activists posted videos to YouTube purportedly showing the moment of the bombing in Zamalka and its aftermath. After the loud crack and orange flash of the explosion come moaning and screams of “Allahu Akbar” (“God is great”) from every direction. As the brown dust clears, the carnage becomes visible: charred bodies, missing limbs and pools of blood. The flag-wrapped body of the funeral victim was lying on the ground. The security forces even fired on the crowd in the bombing’s aftermath, killing a doctor who was trying to help the wounded, said an opposition activists named Bassem, who asked that his last name not be used. 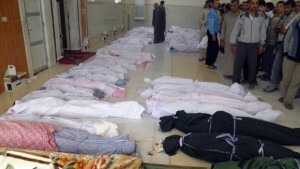 The 85 slain in Zamalka were among 174 people killed across the country Saturday, the LCC said. CNN cannot independently confirm the reports of casualties or violence because Syria restricts access by international journalists. That was a plan and here is another plan ,this one must go and these can stay and this is all they can do !More people are killed day after day!!! !